I was given this book in exchange for my honest opinion. I am a big fan of hygge, the Danish concept of creating coziness in your life and home. Now, I am obsessed with lagom. Lagom is from Scandanavia and means finding balance in moderation. It is that "happy medium" we strive for in all aspects of our lives. This book tells you about lagom, and how to incorporate it in your lifestyle. The idea of lagom is to find that "just right" balance. The concept is easy to grasp, however, the book focuses on tips and ways to incorporate the lifestyle into your own. The concept values simplicity, nature, light, and wholesome foods. The book even has a small section of recipes that look amazing! The book itself is a lovely hard cover book. The design reminds me of Swedish work, contemporary and colorful. It would be an awesome gift for someone who is struggling to find balance in their life. The book balances giving you just enough information so that you want to learn more. It is a perfect beginners book to lagom and I recommend it just for that. 1. Get out and enjoy nature more. 2. Buy less but buy quality. 3. 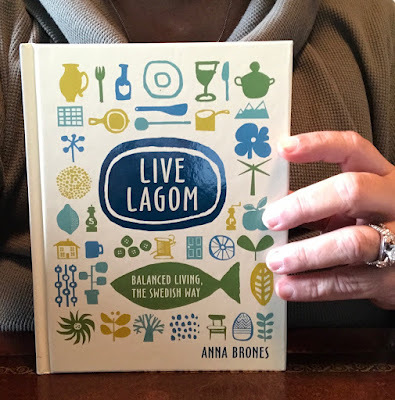 Lagom allows for indulgence and challenge, but balanced with a simple, moderate and wonderful life!